Deekon Jones says he struggled with the transition to college when he was a student. Growing up on the Nez Perce Reservation, Rickey "Deekon" Jones became accustomed to living among a tight-knit community with his family and friends. When he went to college at Eastern Arizona College 15 years ago, that all changed. "I realized there's nobody I can call for anything. I didn't even have a cell phone — I used a pay phone in the dorms," Jones says. "It was completely new and that's where the culture shock was. There was no support for me." Within less than a year, he was back home, preparing to enroll at nearby North Idaho College. But his feelings of isolation in his first year are common for Native American students, who constitute only 1 percent of undergraduate students in the U.S. Less than a quarter of Native American students graduate within four years, according to data compiled by the Postsecondary National Policy Institute. Jones wants to help change that for students at Eastern Washington University. And his strategy is to use what he knows: music. "I knew, for me, writing and music is what helped," Jones says. "So I figured if I can create something that's fun for other people to do, maybe it could help them the same way." Jones developed a music program years ago designed to assist youth in therapy. Now, his nonprofit, New Developed Nations, will partner with EWU to help support first-year Native American students next year. "Eastern wants to build a support system around these students and have something that they can become a part of and support," Jones says. Nicole DeVon, director of Native American Affairs at EWU, heard about Jones's music program years ago. "It's my job to support Native students on campus," DeVon says. "So I'm always on the lookout for resources that best support them where they're at." Previously, Jones' program asked kids to write, produce and perform music reflecting their experience. Jones first tried it out more than a decade ago at the Boys & Girls Club, noticing that kids expressed themselves differently through music than through normal conversation. Later, he brought the program to the Healing Lodge of the Seven Nations, an inpatient drug treatment facility for youth in Spokane Valley, before leaving and starting his own nonprofit in 2016, New Developed Nations. Music therapy isn't an unheard of practice. It can involve creating, listening or moving to music, and it's been used for a range of purposes that can include improving communication for children with autism and helping people with Parkinson's disease improve motor function. 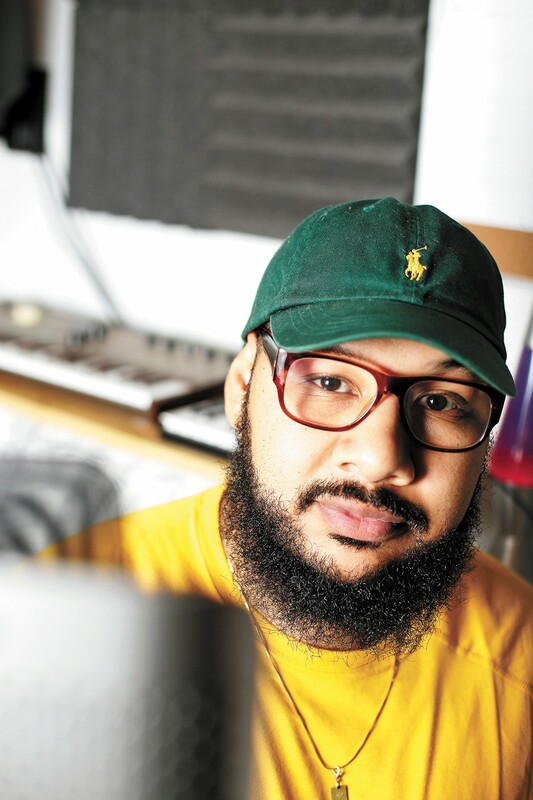 Jones brought students who were in therapy for substance abuse together in a sort of recording studio, encouraging them to write and record music about how they ended up there. Some kids wouldn't want to be involved for weeks or months, Jones says, before they finally opened up and performed a song. Often, Jones says, they would reveal or allude to issues that the kids would otherwise keep to themselves during regular therapy sessions. "We would bring that information to the mental health counselor and get to those root issues," Jones says. The collaborative environment is key, Jones says. Kids who would otherwise be shy would feel more empowered when their peers expressed themselves. It's a more trusting place, Jones says. "If you sit down, and somebody says, 'Tell me what happened to you when you were 7 years old,' they might say, 'I don't want to talk about it,'" he says. The work started to get some national attention earlier this decade. One of the teens who went through the program got second place in a music contest sponsored by the MusiCares and Grammy Foundation, in collaboration with the National Institute on Drug Abuse. Harvard Medical School's Division on Addiction partnered with the program in 2013. "Eastern wants to build a support system around these students and have something that they can become a part of and support." And, importantly, Jones started noticing that the kids who went through the music program had lower recidivism rates than those who didn't. He hopes further research will be able to show that it works, and why. But he also believes it can help college students like him, because when he was in college, music was one of the things that kept him going. "I want to help people who went through the same thing," Jones says. Typically, EWU will see a couple dozen freshmen Native students per year. DeVon hopes those students can be a part of a cohort program that makes their first year in college more welcoming. Those students may be in a few of the same classes in their first year, and other support services will be provided. The idea is that Jones and his music therapy program can be part of that. He would be able to relate to the students and help them express what they're going through — whether that's simply struggling with the transition or struggling with addiction. "We're really excited about the hope of this partnership," DeVon says. "He and I have been talking about it for some time now." Outside the partnership with EWU, Jones hopes to expand his nonprofit. First, he has to convince people that he's serious, that it isn't a "novelty, fly-by idea." But he envisions a campus where kids can come seek counseling from mental health professionals with music therapy as part of it. He wants a place where those who have gone through dark times are always respected. The original print version of this article was headlined "Hitting the Right Notes"